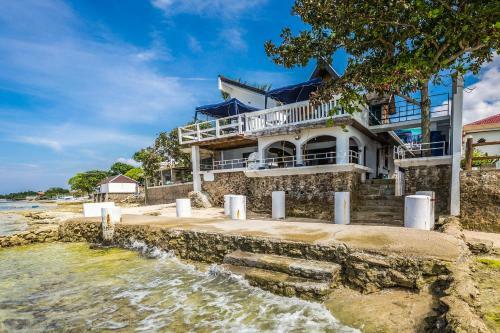 Most travelers go to Moalboal for its world-famous sardine run, but this sleepy coastal town 90km southwest of Cebu City has plenty more to offer. I spent three days, two nights (too short!) in Moalboal as part of my 11-day Visayas backpacking adventure early this year. Allow me to share some lessons I learned. Chili Bar is the busiest spot for nightlife in Moalboal. 1. Moalboal can be difficult to pronounce in the beginning. It’s mo-ahl-bo-ahl. Practice saying it seven times in a row after a few shots of tequila at Chili Bar, the most happening bar in Moalboal. 2. Moalboal is divided into two main parts—a.) Panagsama Road, where you’ll find Panagsama beach, all the bars, cafés, and restaurants, and b.) White Beach, which is no Boracay, but is unspoiled and boasts of fine white sand. To get from Panagsama to White Beach, you need to take a 20-minute tricycle or habal-habal (motorbike) ride. If you don’t have the time or budget for a Pescador Island snorkeling trip, just look for this spot in front of SeaQuest Dive Center, Panagsama Beach. It’s where you can snorkel for free (but rent or bring your own gear) and spot the sardine run. Kate was here. I snorkeled with my iPhone, thanks to my trusty Seaquatix. 3. To get to Moalboal from Cebu City, you may hire a private charter for around ₱3,000 (one-way), or hop on an air-conditioned Ceres bus ride for only ₱130 per person. Travel time is two hours and 45 minutes. From Moalboal’s bus station, get a tricycle that will take you to Panagsama road (where all the hostels and resorts are) for ₱300 (two people). 4. Be cautious of the pushy vendors and tricycle drivers at the Moalboal bus station. While I had a great experience with the locals in Panagsama Road and White Beach, I noticed those hanging out at the bus station were too aggressive with tourists. I was always mistaken for a foreigner, so they would always try to give me the foreigner’s price. When I spoke in Filipino and tried to protect my foreign travel buddies from their scams, I found myself getting into hostile arguments with them. For example, they wouldn’t take no for an answer when we rejected their offer of hiring a private van to get out of Moalboal. We insisted on waiting for the local bus. They kept telling us that the last bus already left and it will take hours before the next one comes. They also insisted that if we do find a bus, we would be standing uncomfortably for the entire trip. When I spoke to them in Filipino to tell them no, they encircled us, refused to leave, and got into a heated argument with me. Thank goodness a bus arrived minutes later (which proved that they lied), and we were able to get comfortable seats (their second lie). Tip: If you feel anxious when getting hounded by aggressive vendors (not just in Moalboal, but any place in the Philippines), walk two or more blocks away from that busy location. When they’re out of earshot and no longer pestering you, that’s the time you whip out your phone, map, or notebook, and discuss plans with your friends in peace. Panagsama Beach, which doesn’t have a wide beachfront. You go straight to snorkeling or boating. 5. Watch out for foreigner’s price versus Filipino price. Sadly, this is a common practice in many tourist destinations, and there’s nothing much you can do about it. For example, a coconut is ₱50 for the locals, and ₱150 for foreigners. A short tricycle ride around Panagsama Road is ₱30 for locals, and ₱50-100 for foreigners. 6. To get around, you may hail a tricycle or habal-habal (motorbike) for ₱30-50 per ride (depending on your nationality and how many passengers will ride) or rent a motorbike for ₱300-500 a day. When you do rent a bike, it starts with a full tank, and you must return it with a full tank of petrol. Not all restos open early in Moalboal. For our pre-canyoneering breakfast, we went to French Café, which opens as early at 7 a.m.
7. Make sure you bring lots of loose change to pay for everything. They might not have enough to break everyone’s ₱500 or ₱1,000 bills. 8. During peak season, you might have a hard time booking a room (especially the budget accommodations) because there are only a few resorts, inns, and hostels in the area. It’s best to book early. In my case, I wanted to extend my stay, but all the rooms in Agoda and all the other booking sites were full! We had to walk around and knock on every door to see if there’s a free room, but to no avail. Backpacker recommendation: We stayed at Moalboal Shaka Water Sports and Resort. 9. Top activities to do in Moalboal: island hopping, snorkel in Panagsama Beach, sardine run in Pescador Island, Badian Canyoneering, explore Kawasan Falls, explore underground springs and caves, and visit marine sanctuaries. 10. Moalboal is the gateway to other Cebu spots a bus ride away, like Santander for diving or Oslob for whale watching. To my fellow travelers who have been to Moalboal, share your tips in the comments section below!